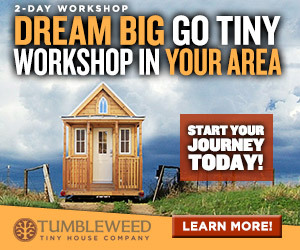 Try on a tiny house for size! Q: How did you decide to build a tiny house? A: I was working seasonal jobs both in Alaska in the summer and in Chile in the winter, and at the age of 25, I didn’t want to keep going back to my parent’s spare bedroom in between gigs. While living in Chile I began to seriously think about building my house in my free months between working seasons. 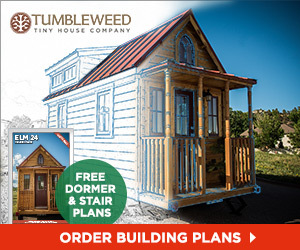 From my bedroom in Chile, I purchased a set of Tumbleweed Cypress plans as well as a Dickinson boat stove. 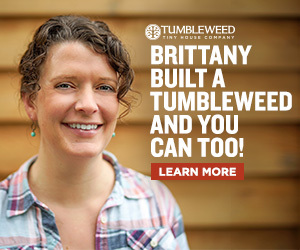 With that I launched myself into a tiny house build project that would change my life forever. Q: How long did it take you to build the house? A: 5 months of full-time work. I was between jobs and therefor working over 40 hours/week on the build, mostly working alone. I had zero building experience, so it took me much longer than I anticipated simply because I had to teach myself construction. I had a few work parties: friends over to put up the Tyvek, paint, hold up big boards, cut out windows, etc. Also, a wonderful friend volunteered to spearhead all of the electrical, plumbing & gas systems for a 6-pack of Alaskan Winter Ale every time he came over. But the bulk of the labor hours were done by me. In about 5 months time, I had a liveable house! Q: Did you have any prior building experience? How did you learn construction? A: I took shop class in 8th grade, does that count? In short, I had no prior building experience. 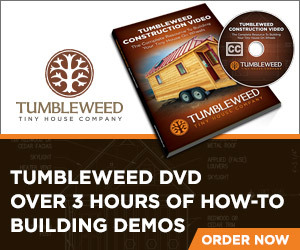 I attended a Tumbleweed Dream Big, Go Tiny workshop and purchased the book Building Construction Illustrated, by Francis Ching, which soon became an invaluable resource. Additionally, I checked out many books at the library on building techniques, watched lots of YouTube videos, picked the brains of the hardware store employees and often phoned friends versed in construction when I got stumped. Yeah, I made my share of mistakes – but there isn’t anything that can’t be fixed! Q: How big is the house and trailer? A: The house is built on an 18 foot flatbed trailer that was purchased second-hand. I do NOT recommend purchasing a used trailer. The house extends a little on either end of the trailer, so the house is about 19 feet long by 8 feet wide (about 8.5 feet including the eaves). All and all, it’s about 160 square feet of living space if you include the loft. Q: How much does the house weigh? Q: Where did you get the sink? A: I found the sink at a flea market in Mexico and brought it home with me as my carry-on item on the plane. Q: Why the burlap sacks in the kitchen? A: Cabinetry is complicated, heavy and expensive. I was inspired by another kitchen I visited that used curtains to hide the shelves. The coffee sacks I purchased for $1 each from a local coffee roaster. Q: What flooring material did you use? A: I used a vinyl plank material that looks like wood. A friend at Don Frank Floors in Portland recommended that I not use solid wood flooring, concerned that the changes in humidity & road vibrations would cause it to buckle and warp. She donated a beautiful batch of leftover vinyl flooring which worked perfectly since I only needed 90sf! Q: What modifications did you make from the Cypress plans? 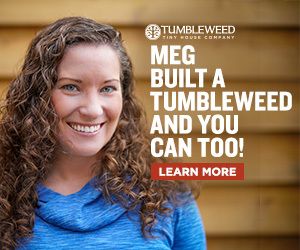 A: I’m glad I purchased plans from Tumbleweed – for the Cypress model – but I did make a few modifications so that the house would fit my needs, taste & size. I flip-flopped the positioning of the kitchen & bathroom so the kitchen faces the garden, and I extended the windows downward a bit so I could see out of the window while sitting at the table. Additionally, I modified the roof line to be gable style (12:12) for the entire length of the house with no hip roof to simplify the build & also allow for more storage in the loft. I’m happy that I made all three modifications. Q: How much did it cost to build your house? A: Around $18,000. I did 95% of the labor myself and with the help of friends, so that includes very little labor cost – the only being an experienced roofer, who I paid to install the roofing material. I bought many items used or second hand on Craigslist (the trailer, front door, skylights, some lumber, etc.) and tried to build nearly everything myself instead of paying for custom-fitting cabinetry or doors, etc. Q: How did you finance your build? A: I did most of the work myself, so the only expenses that I incurred were those for materials. I had saved up a small chunk of $$$, but did end up needing a small amount of credit near the end of the project. Home Depot, through its credit card, offers interest-free 6-month credit on purchases of $299 or more. That’s a free loan! I used that offer to purchase my windows (about $2000) – and it gave me 6 months to work and make a bit of money to pay it off just as soon as I could. Just be sure you can pay it back within the window of “free” interest, or you will get dinged!